Chinese Premier Li Keqiang is shown on a large screen as he delivers a work report at the opening session of the annual National People's Congress at the Great Hall of the People in Beijing, March 5, 2018. China is testing a friendlier stance, at least for now, toward old foe Taiwan as military moves and a diplomatic squeeze have made the island’s leaders angrier. On Monday, the first day of annual legislative sessions in Beijing, Chinese Premier Li Keqiang encouraged more economic and cultural exchanges with Taiwan. China advocates “peaceful development” of relations, he added. His remarks followed China’s release last week of 31 measures that make it easier for Taiwanese citizens to work, invest or study in China — a larger, faster-growing market compared to Taiwan. FILE - Taiwan's President Tsai Ing-wen delivers a speech during the National Day celebrations in front of the Presidential Building in Taipei, Taiwan, Tuesday, Oct. 10, 2017. Relations have slid since May 2016, when President Tsai Ing-wen took office in Taiwan without agreeing to see both sides as one country. China claims sovereignty over democratic, self-ruled Taiwan and has vowed eventually to unite with it. Chinese officials had made harsher statements on Taiwan at past legislative sessions, including the passage in 2005 of an anti-secession law. Taiwan cautiously welcomed the statements this week. China’s harder stance toward Taiwan began to “slow down” in January because they felt it had reached a “saturation” point, said Lin Chong-pin, retired strategic studies professor in Taiwan. 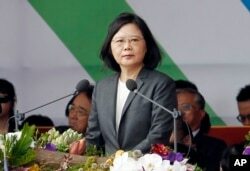 The Taiwan president had grown angry rather than closer to China as Beijing flew military planes near the island, scaled back Taiwan-bound group tourism and choked off Taiwan’s foreign relations. Two countries have switched diplomatic recognition from Taiwan to China since 2016, and Taiwan has lost bids to observe United Nations agencies dominated by Chinese allies. Chinese leaders probably knew through their own pollsters that Taiwanese were willing to work or study in China, Lin added. 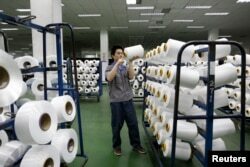 FILE - An employee works inside a textile mill in Yiwu, Zhejiang province. China’s economy should grow 6.5 percent this year, according to a work report released at the National People’s Congress Monday. Taiwanese can earn 1.2 to 1.3 times their normal salaries in China, an executive with the ManpowerGroup employment consultancy in Taipei said. More than 420,000 Taiwanese were working in China as of 2015, Beijing’s official Xinhua News Agency has reported. However, government opinion polls in Taiwan say 70 to 80 percent of the population prefers autonomy from China over unification. China’s easing of conditions for work, study and investment go after Taiwanese citizens directly, requiring no buy-in from Taiwanese officials, Lin said. “Unlike the measures taken under [former Chinese president] Hu Jintao, which required cooperation and participation at least by the Taiwan administration, all these measures don’t need any participation by Taiwan,” he said. The Chinese premier may be using “politically correct” language as well to inspire existing Taiwan investors who face legal issues, said Liu Yih-jiun, public affairs professor at Fo Guang University in Taiwan. Analysts expect little change in official relations following the Chinese premier’s comments or the lowering of barriers for Taiwanese citizens in China. The premier said his government would “absolutely not tolerate” any moves in Taiwan to declare independence from China and that recognition by both sides of a single China would underpin pursuit of mutual prosperity, the Taiwan Affairs Council website says. Taiwan’s president rejects the one-China idea and senior members of her party advocate independence. FILE - Guards of honor parade at the Chiang Kai-shek Memorial Hall in Taipei, Taiwan, Jan. 17, 2016. China has asserted sovereignty over Taiwan since the Chinese civil war of the 1940s, when Chiang Kai-shek’s Nationalists lost to Mao Zedong’s Communists and fled to the island 160 kilometers away. The two sides have been separately ruled since then, though the constitution of each claims the other. 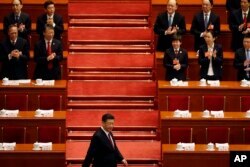 New political issues could fray relations further, especially if Chinese President Xi Jinping extends his term indefinitely after a change proposed last month to abolish term limits, said Sean King, vice president of the Park Strategies consultancy in New York. Chinese President Xi Jinping arrives for the opening session of the annual National People's Congress in Beijing's Great Hall of the People, March 5, 2018. “I’d imagine Xi’s recent long-term power grab will only further alienate Taiwanese, thus making even less likely Tsai will make any concessions,” King said. Once the legislative sessions end in mid-March, Taiwan should expect a resumption in diplomatic pressure such as more foreign allies switching recognition to China, Liu said. The government in Taipei warned this week that Beijing’s focus on economic measures might hide other motives, a turnoff for the Taiwanese public. “Behind the scenes of this, if they hide their political agendas, goals and methods and totally use economic development advantages as a point of consideration, that won’t make Taiwanese people feel any honesty, trust or goodwill,” Chiu said.